FILE - A Pakistani police officer stands guard outside the Barri Imam shrine, as security is beefed up in the capital following a suicide attack at a Sufi shrine in interior Sindh, Islamabad, Pakistan, Feb. 17, 2017. Pakistan hosted a meeting Wednesday with Russia, China and Iran to discuss counterterrorism cooperation. The unusual huddle brought together spymasters from the countries which are "directly affected" by IS-led terrorism. 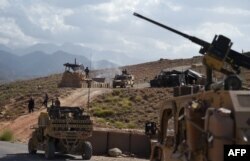 However, it was "not targeted against any other country as it may be viewed," the sources asserted in a bid to allay suggestions that cooperation involving Russia, China and Iran could undermine U.S.-led efforts to stabilize Afghanistan. FILE - U.S. and Afghan commando forces are seen in a checkpoint during a patrol against Islamic State militants at the Deh Bala district in the eastern province of Nangarhar Province, July 7, 2018. A spokesman for Moscow's Foreign Intelligence Service has also confirmed that the emergence of IS in Afghanistan prompted the deliberations in Islamabad. "The conference reached understanding of the importance of coordinated steps to prevent the trickling of IS terrorists from Syria and Iraq to Afghanistan, where from they would pose risks for neighboring countries," Sergei Ivanov told state-run TASS media outlet. He said the director of the Russian spy agency, Sergei Naryshkin, attended the Islamabad meeting along with Chinese and Iranian counterparts. They all "stressed the need for a more active inclusion of regional powers in the efforts" to end the war in Afghanistan. The discussions followed months of Russian allegations that the United States is behind growing IS influence, particularly in northern Afghan provinces next to the border with Central Asian countries. Washington dismissed the charges as rumors, and an attempt to justify Moscow's links to the Taliban insurgency. FILE - People protest against an Islamic State-claimed attack in Peshawar, Pakistan, Feb. 17, 2017. "This is a group, which has up to 10,000 fighters in its ranks, and it is already active in at least nine out of 34 provinces ... and is constantly consolidating its positions in the north of the country, turning it into a springboard for its expansion into Central Asia," Nebenzya said. Iran, which shares a long border with Afghanistan, has raised similar concerns in the wake of IS's growing terrorist activities in the region. 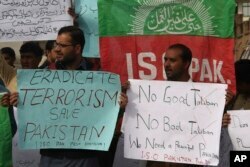 Pakistani officials maintain the terrorist group has established strong bases in "ungoverned spaces" in Afghanistan and plans cross-border terrorist attacks from there. They cite U.S. military assessments that the Afghan government controls less than 60 percent of the territory. But the diplomatic ties with insurgents have upset both Kabul and Washington because they see them as an attempt to legitimize the Taliban's violent campaign.